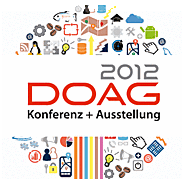 Only one week to DOAG 2012 - the most important conference for Oracle users in Germany. The event takes place in Nuremberg, Nov 20th – 22nd. This year there will be 26 presentation on Oracle Application Express alone! Make sure to attend the sessions presented by Patrick Wolf, Christian Neumüller, Carsten Czarski, Peter Raganitsch, Dietmar Aust, Niels de Bruijn and other members of the APEX community. Thanks and see you all next week in Germany!